Iyama takes 3-0 lead in Honinbo title match: In the 70th Honinbo title match, Yamashita Keigo is seeking to regain the title that he lost to Iyama Yuta in 2012. He is also seeking revenge for his loss to Iyama in this year’s Kisei title match. As defending champion, Iyama is hoping to maintain his quadruple crown; after losing two titles at the end of last year, he will be anxious to avoid any further reductions to his swag. Also, if he defends his title, it will be his fourth in a row, so he will draw near to qualifying for the title of Honorary Honinbo. Just as in the Kisei title match, Iyama has made a great start, sweeping the first three games. In the Kisei, Yamashita staged a recovery, winning three games in a row himself. Will he be able to do it again? The first game was played in the Fugetsuro pavilion in Shizuoka City on May 13 and 14. This was the hometown of Tokugawa Ieyasu, the warlord who founded the Tokugawa Shogunate, and the game was one of the events in the celebration of the 400th anniversary of Ieyasu’s death. The Fugetsuro is located on the estate of the 15th and last shogun, Tokugawa Yoshinobu. Yamashita drew black in the nigiri. He was doing fairly well in the fighting, but a couple of slightly dubious moves let Iyama into the game. Yamashita then made a misreading about a possible capturing race and so failed to play the best move. 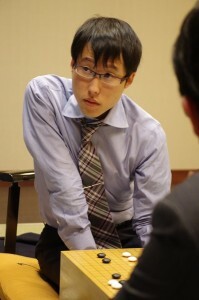 Although he was still ahead on the board, he couldn’t give the komi, so he resigned after 164 moves. The second game was played at the Shikimeien garden in Naha City, Okinawa on May 25 and 26. Fierce fighting started in the opening. In the middle game, Yamashita (white) made a fatal blunder and fell behind. Iyama wrapped up the game safely, and Yamashita resigned after 177 moves. 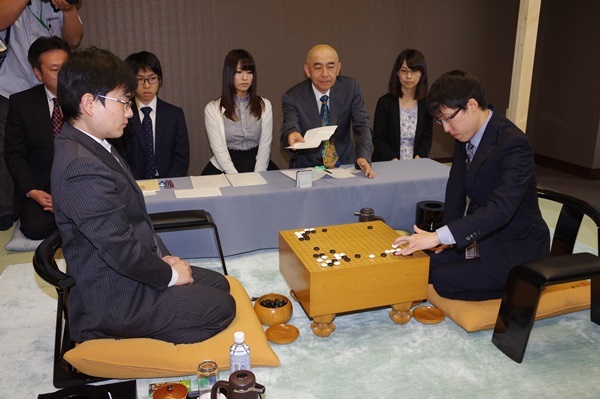 The third game was played at the Jozankei Resort Spa Mori no Uta (Song of the Forest) in Sapporo City, Hokkaido on June 3 and 4. In this game, there was no major fighting — when the first proper fight looked like breaking out, the players settled for a peaceful trade, and when another fight looked like starting, it again ended peacefully. In each case, it was Iyama (white) who made the decision to avoid a fight; it retrospect, it can be said that he was confident he had a lead and he denied Yamashita any chance to exert his strength. The latter resigned after 142 moves.